In the end, it was Germany hoisting the trophy and ESPN crowing about viewership. But here in Maryland, where soccer enjoys a passionate following (see: Gold Cup, 2013) there were plenty of other big winners. For those who kept spirits high and beverages flowing while the games kept patrons riveted, the 2014 FIFA World Cup was a five week fiesta. 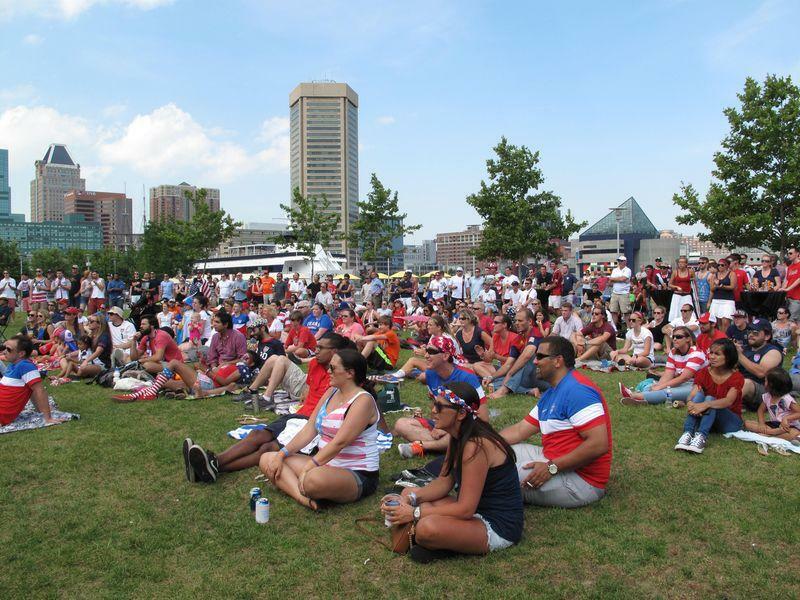 Much of the focus in Baltimore and National Harbor (considered part of the DC demographic) was on the large gatherings in front of jumbo screens during the US matches. You found these along the Potomac at National Harbor, on Westside Park in the Baltimore Inner Harbor, and at Power Plant Live!, the entertainment district just north of the Inner Harbor. The outdoor lawn settings were popular with picnicking families, or workers leaving the office. Power Plant Live!, however, had a more energetic and mobile crowd when USA made their debut against Ghana. In fact, it was more than a lunch hour could provide. Blessings to the Charm City Circulator for the lift back to the office. Although the big screen events in Baltimore were ended by Belgium’s narrow win, the gatherings continued in local watering holes for the elimination rounds. Even pubs not known for having a soccer culture (like our Sunday brunch hangout) found themselves packed as newly interested fans wandered in and decided to stay. To get the best possible World Cup atmosphere this side of Rio, I journeyed to a place in Fells Point where “soccer is religion.” (No kidding – that’s their slogan.) Despite arriving more than an hour before kickoff, I found myself in a line stretching to market square. It was already well into the first half when they squeezed the two German partisans I’d attached myself to onto a third floor deck full of Argentineans. Not the best situation, but at least we could wave to the line still assembled below. For the sake of research, I left before the end of regulation time to see if this phenomenon was occurring anywhere else. From Fells to Fed Hill; from Power Plant to Mount Vernon, the tubes were blaring. There were many formulas for calculating viewership, but according to Nielson, this region was riveted. The top-10 metered markets were New York (15.0), Hartford/New Haven (13.2), Washington, D.C., (12.8), Richmond (12.3), Boston (12.2), West Palm Beach (12.0), Baltimore (11.4), Cincinnati (11.4), San Diego (11.0), Columbus (10.8), Norfolk (10.8) and Orlando (10.8). Perhaps it is, as pundits have observed, because Baltimore is a city of immigrants. Or because so many internationals, like those two young Germans, study here. Or maybe – just maybe – Americans are finally getting excited about The Beautiful Game. For whatever reason, thousands of people found fellowship and camaraderie in the watering holes of Baltimore during the World Cup – proving yet again why it is a great destination for international soccer.